Download Camera FX application for FREE for the next 24 hours ONLY! 1 million users love Camera FX! 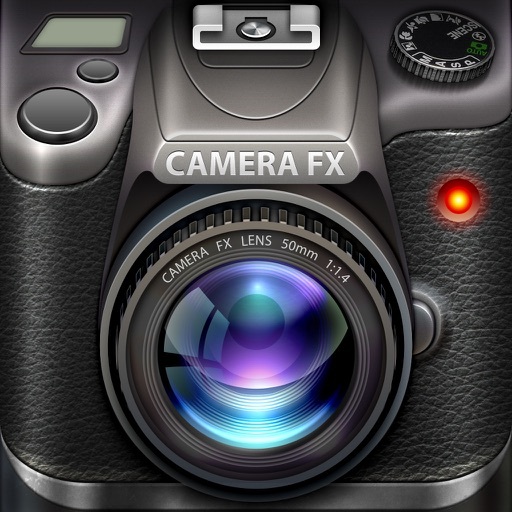 Camera FX is a new reference application for iPhone and iPod Touch. Add fully original and striking effects to your photos and give them style. ◉ Support for iPhone 5 widescreen (16:9) display. ◉ Take photos fast by configuring the Flash option (Auto, On, Off) and the camera (back or front) in the interface. You can also import photos directly from the iPhone photo album. ◉ All of the filters have been carefully created for this application to make your photos more expressive and life-like. Not available anywhere else! ◉ Ideal for photographers wishing to use the iPhone as a professional, practical and efficient camera. ◉ Facebook photo sharing option is working again. • Enter a short text to describe your photo on Facebook and Twitter by pressing the icon on top, left-hand corner of Share page. • Touch the screen to switch from AUTO FOCUS to MANUAL FOCUS when taking a photo with Camera FX. You can now adjust the focus manually. • Camera FX app has the best black and white filter called "MARILYN". Check it out! • Don't forget to authorize photo permissions for Camera FX application to save your photos to the Camera Roll. Go to Settings (iPhone) > Privacy > Photos > Turn ON Camera FX app. ✔ X-PRO II filter improved. ✔ Contraste slider has better controls now. ✔ Facebook photo sharing feature has been fixed in this update. You can now share again your photos on Facebook by turning ON the option in the Settings of the application. ✔ IMPORTANT : You need to press "Change username" in the Settings of the application to enable Facebook photo sharing feature again. ✔ Huge memory improvements and optimizations. ✔ HD option added in the Settings for iPhone 5 (iPod Touch 5) and iPad only. Save photos in high-resolution.